Had an extremely productive night tonight. Ron was able to stop by on his way back to Chicago and help me out with some Halloween animatronics I’ve been working on for this year’s haunted trail. He was able to improve the sound on my Clown in the Box from last year (link here) and helped work out the kinks on my latest project Nightwing. This new one uses a linear actuator and some fairly complicated linkages. Also have some other new props in the works – shaping up to be another fun trail this year. Since it is going to be a bit hectic around here as the month progresses, figured I’d go ahead and get the second post of the Gander Mountain series out of the way. Going to start with the prize find from our first visit to Gander back in May of this year. Mr. Red-Eye represents a +1 to my list. 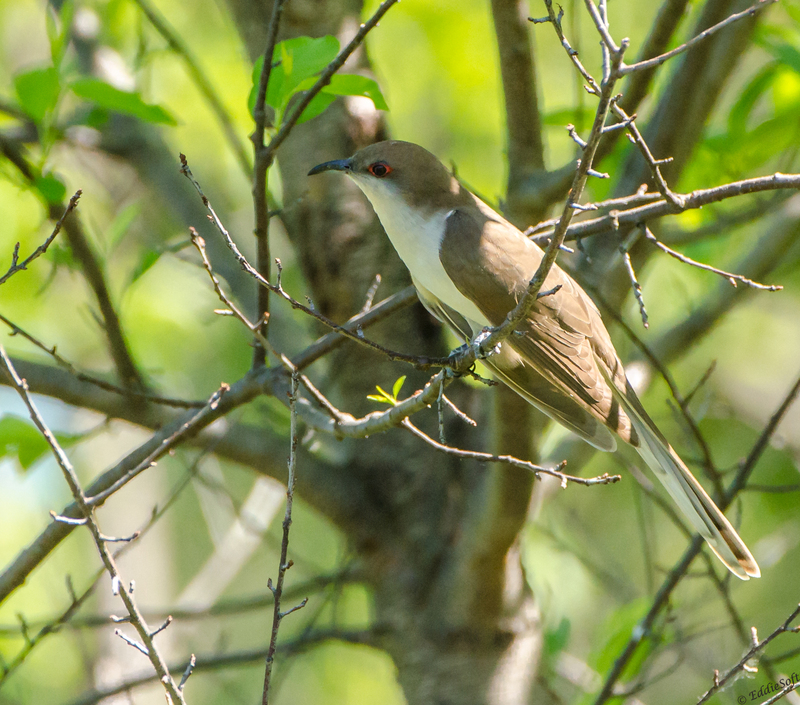 That colorful eye, white undertail feathers and the black downward curved bill indicates this medium sized bird is a Black-Billed Cuckoo. These birds generally range in the eastern half of the US expanding a bit into Canada and then down into the eastern half of South America. A fairly broad range for a bird I’ve only seen twice now. 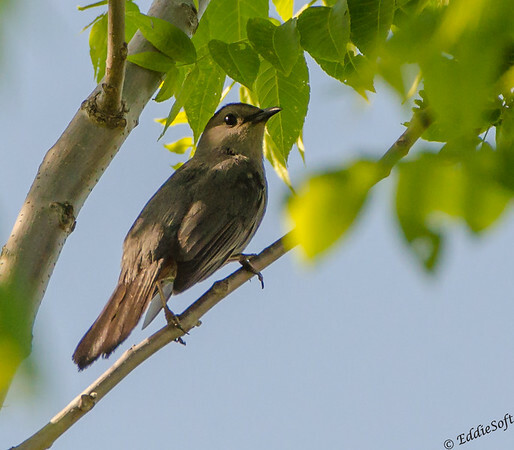 Even Cornell mentions how elusive and secluded this species is. You might be able to hear them foraging through the tree branches looking for Caterpillars – getting eyes on and much less a focus point is a difficult task at best. My first encounter was up at Midewin National Tallgrass Prairie (or as I call it the bunker prairie link here). I was able to get a few shots in the tin back then, but those pictures still need to be processed – those were really far away and not likely to yield better shots. Instead, using this encounter as my official +1. The shot below gives a little better view of the white under tail and that ominous blood red eye. This Cuckoo should be named the official mascot of late night bingers. Since this is the first time this bird has appeared here, wanted to grab an interesting tidbit as a takeaway. 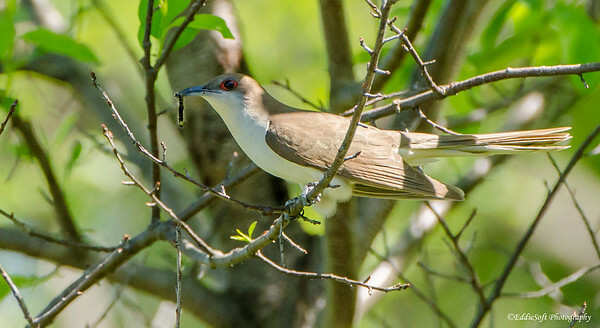 These Cuckoos love them spiny Caterpillars – see the first shot for proof. Most predators are deterred by those spines, however Cuckoos gobble them up like Peeps during Easter (maybe that analogy only applies to me). Cornell states that those spines end up sticking to their stomach lining. Periodically, the Cuckoo will resolve this discomfort by coughing up their stomach lining in one giant pellet. My apologies if you are having breakfast while reading this – nature be crazy ha. Hit the jump to see more items from the tin that day. Greetings from the wetlands everyone! 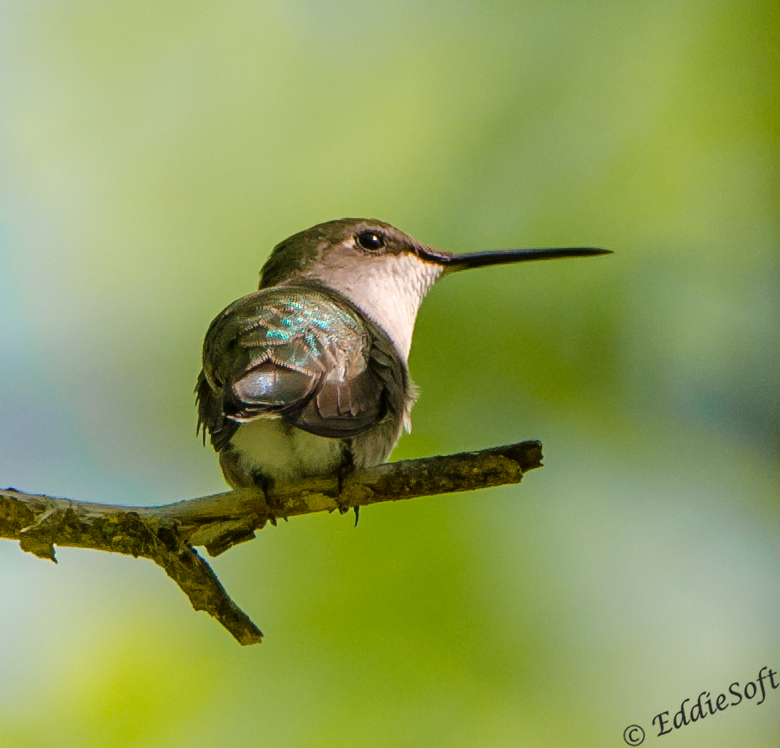 If you recall, last weekend my brother Ron and I were planning to do some birding near the Illinois-Wisconsin border. My youngest poodle was running in an agility competition up in Spring Grove and we were camping at our favorite state park up there, Chain O’ Lakes. Since Ron lives in Chicago it’s a fairly short drive to meet up and hunt down some birds. I also mentioned we have the uncanny ability to force it to rain simply by planning the outing. True to course, IT RAINED.. in fact it rained before we left, then rained on Saturday and again on Sunday and basically ever since. Now, this also may be due to us just having a new well drilled – Murphy’s Law for sure. The good news is we were able to get our birding in between the storms on Sunday! One of the places we decided to visit was Gander Mountain Forest Preserve near Antioch IL. Last year was an awesome outing netting a ton of birds and even a +1. However, this year … TOTALLY SUCKED! Might go into how awful it was in the second of this two part post, but for now I thought I’d simply go back to our previous visit back in May and finally process and post some of those finds. First off, the smallest find of the day. Hit the break to see ore finds from the Gander trip.